On the cusp of hotly contested local elections in which the supremacy of the African National Congress faces strong challenges in major cities, church leaders in South Africa have appealed for calm. They have asked political leaders of all political parties to help contain dissent. The run-up to the elections on Aug. 3 has been marred by recurrent bouts of violence, intimidation and even political assassinations, some of them in internecine fighting in the major ANC party. "Has our country descended to these low levels and becoming a mafia State? Let it not be so. God forbid!" Bishop Malusi Mpumlwana, general secretary of the South African Council of Churches, said in a statement for the elections. "That is not the promise of South Africa; that is not the South Africa we pray for," said the leader of the SACC, a body that was at the forefront of the struggle against apartheid in the 1970s and 1980s. "Too many lives were lost in our struggle for democracy - and yet, even in sovereign freedom, killings continue, especially in the last few weeks," Mpumlwana, who is bishop of the Diocese of Maropeng of the Ethiopian Episcopal Church, said. The SACC is the umbrella body for 27 of the country's larger churches, including the Roman Catholic, Methodist, Anglican, Presbyterian, Dutch Reformed, Apostolic Faith Mission, Baptist and Lutheran churches. In recent months church leaders have had a strained relationship with the ANC government, which has ruled since the first all-race elections for a national parliament in 1994. The ANC and the SACC were close allies in the struggle against apartheid. After church leaders called on President Jacob Zuma to resign, following a judgement by the Constitutional Court on March 31 that found he had violated the Constitution, they themselves came under attack. "The role of the Church is nothing else but to preach reconciliation, forgiveness and to build the nation, as they have done during the anti-apartheid struggle," Mpho Masemola, deputy national secretary of the pro-ANC Ex-Political Prisoners' Association, told reporters in April. "And as your Archbishop, when I see the absence of moral authority in our country, I feel fear. When I see public representatives on gravy trains of sleaze and dishonesty, oblivious to those who are hungry, I feel fear." A few days later Makgoba spoke at a graduation ceremony at the University of Witwatersrand in Johannesburg on the day of the Constitutional Court judgment against Zuma. 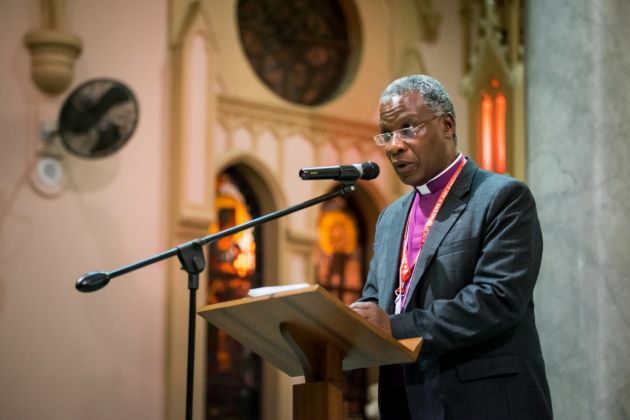 Makgoba has the Anglican leadership once held by the iconic Desmond Tutu and is also chairperson of the National Church Leaders Forum and spoke of a new struggle - this time against endemic corruption, nepotism and greed— and the need for courage. Referring to the late Nelson Mandela, he said, "During the last years of Madiba's life, I spent a good deal of time with him. Through him I was constantly reminded that courage is not the absence of fear but the capacity to triumph over it. "The brave woman or man is not the one who does not feel afraid, but the one who conquers their fear." "And I hope that today's Constitutional Court judgment finding that both President Zuma – in seeking to dodge the Public Protector's findings on Nkandla – and Parliament – in seeking to protect the President – acted unlawfully, will give public servants and others new courage to speak out – and generate not just a wave but a tsunami of truth-telling." The metropolitan areas, where Zuma is unpopular, are hotly contested in this election and the ANC faces challenges on its grip in power in cities such as Johannesburg, the biggest urban center, Tshwane (Pretoria) and Nelson Bay (Port Elizabeth), the fourth largest metropolitan area. The SACC's plea to pastors is: "To anchor our democracy in integrity of processes, the SACC requests that local churches intensify prayers and pastoral interventions in communities where peace must be restored, to maintain orderly coexistence across political divisions." In the late eighties, when anti-apartheid political organizations were banned and most civic organizations restricted, the churches stepped into the vacuum, leading to a heated church-state conflict during the dying years of apartheid. In May 1988, the SACC launched a concerted program of mass Christian action called the Standing for the Truth Campaign, invoking the wrath of the government of P.W. Botha, a hardline apartheid president, who made some minor reforms. "There can be little doubt that the Church played a key role in the ending of apartheid," theologian John de Gruchy wrote in Christianity and Democracy: A Theology for a Just World Order. Professor Tinyiko Maluleke, a political scientist at the University of Pretoria and a former SACC Council member, said at a recent conference there that after the advent of democracy in 1994 the ANC tried to control the organized church. According to him, the ANC's way of keeping the SACC in line was to give former SACC leaders government positions. Archbishop Desmond Tutu was appointed chair of the Truth and Reconciliation Commission, Frank Chikane was given a position as director general in the presidency, and Father Smangaliso Mkhatshwa the mayorship of Tshwane. "This was a strategy to keep the SACC, the radical left churches, under control," said Maluleke. Are the churches doing enough? South African theologians disagree about the level of church engagement in the present situation and its public impact. Professor Madipoane Masenya, Professor of Old Testament Studies at the University of South Africa (UNISA), said, "In a nutshell, I think one would be unrealistic to expect a church and religious leadership that did not grow out of a prophetic tradition, to start prophesying now towards a just society, especially now that 'the enemy is within us.'" But Rev. Mary-Anne Plaatjies Van Huffel, moderator of the General Synod of the Uniting Reformed Church in Southern Africa and a president of the World Council of Churches, said that during apartheid the media played a huge role in covering church opposition on "the ills of society in apartheid South Africa." She said therefore the perception was that the churches played a large role. "Currently the media is reluctant to give much attention to the SACC, National Church Leaders Consultation or churches' statements on the ills of society. "The lack of media coverage led to the illusion that the churches, faith communities and the SACC do not attend to socio-political and economic justice issues in post-apartheid South Africa," she said. Plaatjies Van Huffel believes that religious communities are as active as ever in dealing with socio-political and economic ills in society, pointing out, for example, that the SACC has launched a program called The South Africa We Prayed For. Masenya was asked what challenges religious leaders are facing at the moment. She said, "Leaders need to be transformed from the old mode of remaining in our silos and understand that it is our responsibility to impact the lives of our communities holistically, taking our cue from the eighth-century prophets." Masenya noted that many younger black theologians are dealing with "issues such as racism, black affirmations, gender criticism, HIV and AIDS, social injustices, issues that continue to bother South Africa. But the question is, who is listening to us?"